I hope you all brought in the New Year with a bang even if that bang only involved a pillow and a night light. I brought in the New Year with a quick game of monopoly, greens for wealth and black eyed peas for luck. The first video of the year is uploading as we speak. 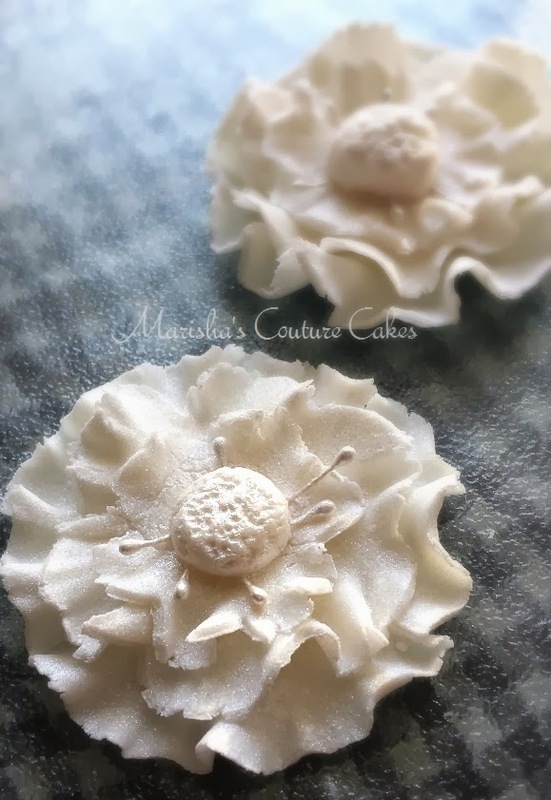 Fondant Ruffle Flowers. I've been meaning to try these out all year and they are incredibly simple. I think they only took me about a half hour to complete. 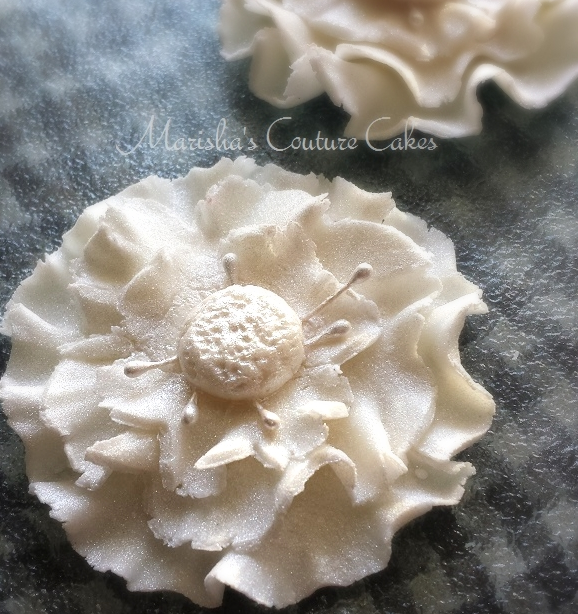 This Saturday I'll be knocking out as many flowers as I can with my last bit of fondant. So before I get to work, I figured I'd give you guys a step by step post on these gorgeous ruffle flowers! 1. Start out with rolled fondant (color of your choice). Use 1 medium and 1 small circle cookie cutter. Each flower will take 3 layers; Cut out 2 of the medium shapes and 1 of the small. 2. Use a toothpick or something similar to gently roll out the edges of the shapes. It's extremely easy. With the tip of the tool roll back and forth around the perimeter of the circles, staying along the edge of your pieces. You can choose to create a dramatic flare by pressing harder or a subtle flare by pressing lightly. 3. Place your ruffled pieces into a cupcake pan and let dry over night or at least until slightly hardened. I like to have some flexibility with the flowers so I'd prefer not letting them get completely hard. 5. Create your center piece by rolling a small ball of fondant and lightly pressing to create a button shape. Finish by pricking the piece with your toothpick to add texture. Dab the bottom with water and place in the center of the flower and over the ---. Optional: Finish the look with luster dust. I used a silver pearl color. Voila, gorgeous ruffle flowers for your cupcakes and cakes!